The lesson was held this week and the responses from the students were generally very good. The students were quite excited and learned all the different functionalities very quickly. Some students expressed a desire to continue using Protosphere for the remaining lessons of this course (we usually use Interwise as the meeting platform). 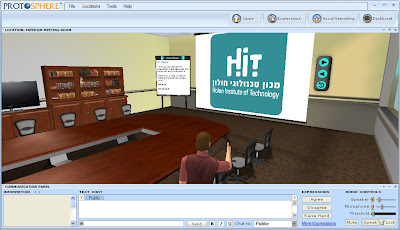 - We provided the students with a link to the trial download, via the course' forum a few days prior to the lesson (We also created a short presentation describing the first steps of creating an Avatar, moving around etc.). - We offered the students a pre-session, where our avatars accompanied anyone that was interested in the environment and addressed their points of confusion. - In the beginning of the lesson, two members of the team welcomed the students as they entered the Welcome Center, and helped them with their first steps. - After doing some tests (prior to the lesson), we decided that the audio part will still be handled via Interwise. - The first portion of the lesson was held in the Freedom Meeting Room (we thought it would be good to start with an intimate space). We used the presentation board (with pre-loaded images) to portray general aspects abouts 3D learning. We used the Note Board to explain about this segment of the lesson. During this activity we also presented questions to the students. The student raised their hands to vote (yes / no questions) and at some parts "vote by their feet" (walked to one side of the board if they agreed and to the opposite side if they didn't agree). Some questions were open questions, where people volunteered to tell their answers to the class. - The second portion started as a Guided Tour in the Learning Archetypes space - this was just what we needed, as it matched the 3DLE Model we were covering during the class. We used the 'Invite' function to relocate the students from one area to the other (to avoid confusion). Then we gave them a task -to take 5 minutes and explore the different spaces and then meet back in the Trade Show Hall, where they would sit in small groups in the private zones and think together about different learning activities that they can conduct in the different spaces. We also encouraged the participants to try and upload images, write comments etc. The last part was held in the Constitution Classroom, where we continued the theoretical part - By the way, most of our slides are still on the different boards, if you are interested to have a look (they are in Hebrew, but you could probably figure out most of it :)...). Yael went on to provide me with some additional feedback in areas where we could improve the platform, which have already made their way to my features request list.